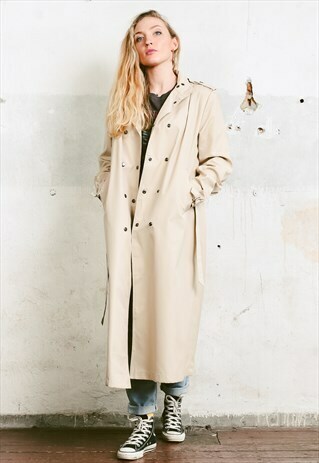 You are looking at a classic and super versatile vintage 90's beige trench coat with double snap button closure, a high collar, a tie belt, 2 outside pockets and adjustable cuffs. Made of polyester-cotton blend, lined with nylon. Perfect for comfortable everyday wear. -- MODEL is 5'5 ft (1,67 m) tall, she wears size available. -- SIZE. Estimated fit: size M (marked size 36). To be sure it would fit please check the measurements: Length: 46 " / 117 cm . Armpit to armpit: 22 " / 56 cm . Shoulder to shoulder: 17 " / 43.5 cm . Sleeve: 23 " / 58.5 cm. MODEL is 5'5 ft (1,67 m) tall, she wears size available. SIZE. Estimated fit: size M (marked size 36). To be sure it would fit please check the measurements.